PORT ROYAL, Pa. – A field of 136 race cars did battle at Port Royal Speedway on Saturday night in the annual Blue Collar Classic featuring the Keystone RaceSaver 305 sprint cars. 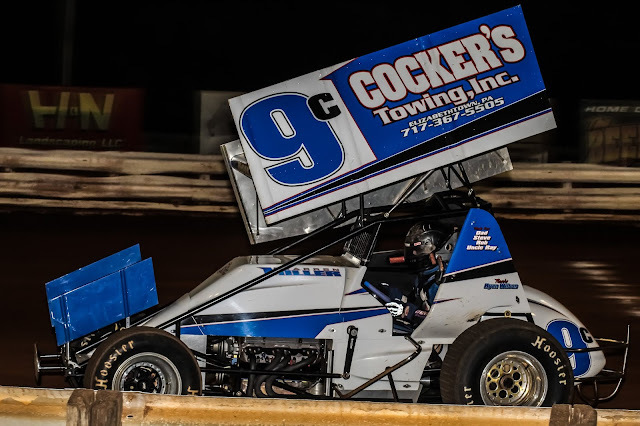 Darren Miller of Mount Joy won the biggest race of his career by taking the 305 sprint car main after inheriting the lead on the final lap when a crash took out Kyle Smith. The Mason Dixon Series limited late model main went to Juniata County driver Trent Brenneman in a rare limited start for the super late model regular. The xtreme stock feature was won by Bill Powell, who also scored the 2018 track title with his feature run while Eric Boozel pulled a last corner daredevil move to win the four cylinder pure stock feature event. Polesitter Kyle Smith was headed to the victory in the 25 lap 305 sprint feature after wiring the field when disaster struck him in the final turn of the race. Just in front of him, a pair of cars racing deep in the pack collided and turned over in the fourth corner as Smith raced into the third turn amid lapped traffic. And with nowhere to go, Smith slammed into the crash scene on the high side as the red flag appeared for the original crash. Darren Miller raced in second the entire distance, at times keeping pace with Smith and at times watching as he drove away. Smith proved flawless in traffic, having entered the backmarkers on the 13th tour and Miller was in the right place at the right time when Smith’s misfortunes struck. A one lap dash to the finish played out on the lap 24 restart with Miller jetting away from Jeff Miller to pick up the win. Darren Miller ended up taking the $800 victory by .433 seconds to record his second career Port Royal division win. Zach Newlin blasted into third on the last lap restart, getting around Austin Bishop in the first turn when action resumed. Bishop, up from 18th starting spot, ended up fourth with Jonathan Jones finishing fifth. Heats for the 52 cars went to Darren Miller, Kyle Smith, Drew Ritchey, Jake Waters, Jon Haegele and Jeff Geiges. Twin consolations went to Kyle Ganoe and Justin Clark. Fast time was set by Waters with a lap of 17.979 seconds. Jaremi Hanson muscled by Stephanie Dodson on a lap one restart to get the lead and win in the 15-lap Founders Cup event for 305 sprint non-qualifiers. The 20-lap limited late model main was riddled with caution flags over the entire distance. Polesitter Shaun Jones led only the first lap before Trent Brenneman motored around the top lane to get control. Once in control, Brenneman withstood no less than five restarts to get the victory worth $1,000. Jones faded from second spot late as Brian Shuey took second and threatened to mount a challenge for the win before slowing to a stop with four laps to go. The restart placed Justin Weaver behind Brenneman, where he would finish by 1.552 seconds. Andrew Yoder, Dylan Yoder and Jones completed the top five finishers. Heats went to Todd Snook, Brenneman, Greg Moore and Jones with twin consolations going to Derick Garman and Dylan Yoder. Brad Mitch crossed the finish line first in the 20-lap xtreme stock main followed by Pete Leister but both drivers failed post race inspection. This handed the win to Bill Powell, who raced in third the entire event. Credited with second through fifth place was Dustin Hoffman, Kevin Imes, Matt Wampler and Walt Peters. Heats went to Leister and Mitch. Eric Boozel led early in the 15-lap four cylinder pure stock feature only to succumb to the pressure of Matt Chronister. Chronister kept Boozel at bay until the final corner when Boozel pulled his equivalent of a slider to get the lead back and steal the win away. Chronister then held on for second in a close finish with Matt Worley. Justin Williamson and Kent Leonard completed the top five. Heats went to Boozel, Justin Oberlin and Worley.